A crumhorn is not a cromorne, but a cornamusa or a piva. It is a capped reed instrument that is hookshaped. According to the 1996 book by Anthony Baines, European and American Instruments, it is also extinct, though "it flourished in the 16th and 17th century, especially in Germany and Italy". Well, Mr. Baines, crumhorns are not only flourishing again in our neck of the woods, but they are proliferating and adding zest to any early music performance. Actually, crumhorns with a professionally turned and exactly fitted wooden cap begin to turn up towards the end of the 15th century. They were a technical compromise between taking the reed directly between the lips and feeding air from an inflated bag (bagpipe). Primitive reed caps have been found among hornpipes, so the idea of a cap with a hole or slit on top through which to blow air to set the reed in motion has been around for quite a while. 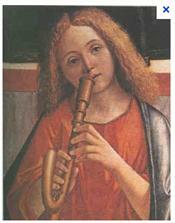 Boxwood was the preferred material used for crumhorns. Usually the instrument had a narrow cylindrical bore from about 0.38 to 0.85 cm in diameter, depending on pitch and size of the instrument. The original straight pipe was bent round with the aid of heat after having the bore pierced with seven finger holes plus one thumb hole as well as a vent hole farther down. In its hay days, a set of crumhorns consisted usually of six instruments: ~a descant, two trebles, two tenors and a bass. A klein diskant and great bass also existed. A consort of six crumhorns was easily maintained, offered a cheerful, nasal sound and thus pleasant in-door entertainment. It has one shortcoming, namely that its range is limited to an octave plus one whole step since, unlike the recorder, it does not overblow into the next octave. Several modern makers did extend the crumhorn range through the addition of one or two keys which added a hole, respectively a tone and a half. Modern crumhorns are either c instruments (soprano, tenor) or f instruments (alto, bass). In the Middle Ages, the klein diskant ranged from c'-d"; the descant (soprano) from g - a'; the alto/tenor from c - d'; the bass from F - g; and the great bass from C - d or B - c. The natural cane reeds have given way to plastic reeds which are less fragile and can last for years. Of course, if you are a purist, you better start making your own cane reeds. There are fairly detailed instructions on how to do that - but they are too lengthy to be included in this article. Music in the 16th century was rarely written for a specific instrument or group of instruments. Instead, one used what was at hand. However, there are exceptions, such as a six-part "Shepherd's Chorus" in the wedding music written by Francesco Corteccio in 1539 for the Court of the Medici and Joh. As you well know, MPRO has a very sizable contingent of enthusiastic crumhorn players who are definitely not extinct. Yet! I am pleased to announce that Irene Beardsley will be playing keyboard with MPRO at its May 2 meeting. Since this will be the last time before the dress rehearsal for the June 2 concert to rehearse some of the music for that performance with all forces present, I encourage everyone to attend this meeting. Listed below is the music for the orchestra's next two meetings. Please note that there will be sectional seating for the Stradella Sonata, with those playing the Soprano 1 and 2, Alto 1 and Bass 1 parts sitting on the right as they face the conductor and those playing Alto 2, Tenor, Bass 2 and Contrabass on the left. Please observe this seating arrangement when you choose your place at the beginning of the meetings on April 25 and May 2. Please note as well that bass viola da gamba and great bass and contrabass recorders will be needed at both meetings and sopranino recorder, dulcien and krummhorns, on May 2. Welcome to MPRO! You�ve all helped to make our orchestra better than ever! The Albany Consort: Led by Jonathan Salzedo and Marion Rubinstein who present their string chamber orchestra playing a mix of music from the Baroque, as well as the 20th century. (www.albanyconsort.com/ ). Flauti Diversi - A Tale of Two Composers: Boismortier & D. Purcell. Frances Feldon (baroque flute, recorder), David Morris (violoncello, viola da gamba) & Katherine Heater (harpsichord). Beguiling, elegant trio sonatas by Joseph Bodin de Boismorter for baroque flute, viola da gamba, and harpsichord; and fiery, quirky solo sonatas by Daniel Purcell for recorder with harpsichord and baroque cello.